2. How has the Mobile Clinic done? 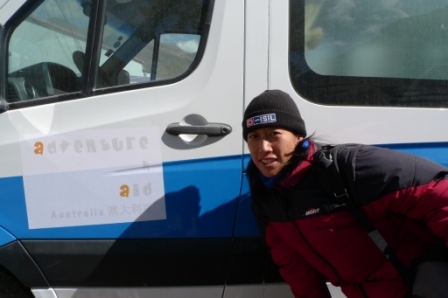 In 2010-11, Adventure4Aid raised ~AUD$90,000 through our various fundraising activities, the main one was climbing 6,000 metres up Yuzhu Peak in the mountainous region of Qinghai, China. 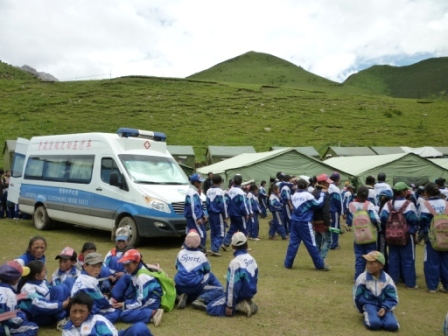 With these funds, we could afford to purchase TWO Mobile Clinics, but purchased one first, as this kind of vehicle and project had not been attempted in this very high altitude before (~4,000m). 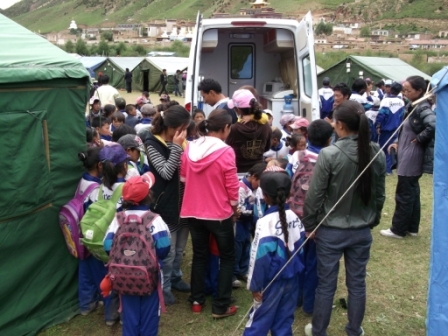 From 2011, our vehicle provided free medical support for the nomads living around the grasslands of the 2010 earthquake epi-centre in Yushu County, Qinghai. Late 2011-2012, the vehicle started to experience mechanical problems and was not working optimally in the more extreme low oxygen conditions. However it still transported doctors, nurses and medicines up to safe altitudes where nomads could still access LOVEQTRA’s services. After a year of lengthy negotiations with the manufacturers, in 2013, LOVEQTRA obtained a refund of the bare vehicle price. LOVEQTRA have done extensive national market research and testing on potential replacement vehicles with the specifications we require. The type of vehicles appropriate for our needs are only manufactured in other provinces, adding to the complex logistics. A replacement vehicle was purchased, however at a more expensive price, in addition we had to fit the new vehicle with necessary medical equipment. Hence we had one good vehicle and the balance of the funds were put to medicinal supply for the Clinic. The new vehicle began service in July 2014. 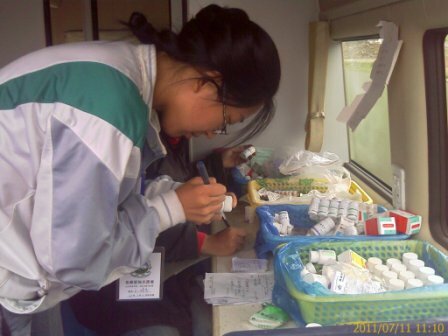 In LOVEQTRA’s 2014 medical report, the funds needed to equip the Mobile Clinic with the necessary medicines is approx. CNY48,000; which was approx. (at the time of sending), equivalent to AUD$9,000. An extra AUD$5,000 was sent in 2014, totalling AUD$16,000, which should cover the medicines to supply the Mobile Clinic for just under 2 years. 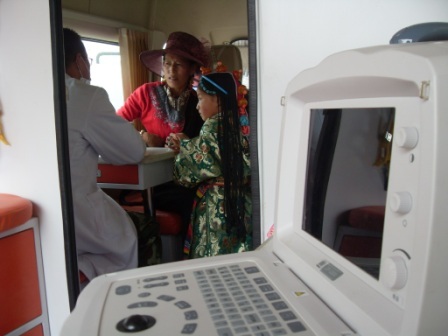 Since the beginning of the Project in 2011, the combined Mobile Clinics have serviced approx. 10,000 patients with medical consultation, advice and/or referral. Common issues were hypertension, arthritis, Hep B, gynaecological diseases, tuberculosis, gallstones, peptic ulcer. 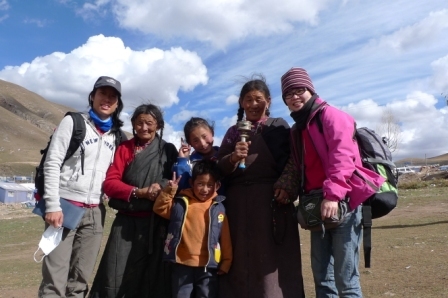 foreign as well as local volunteer doctors and nurses to serve the nomads’ needs. teams of local, domestic, and foreign, short to medium-term volunteers to offer their services. 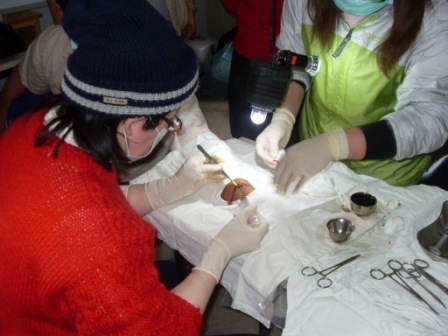 training of 5 long-term health workers (2 doctors, 3 nurses) specifically servicing the quake disaster areas. 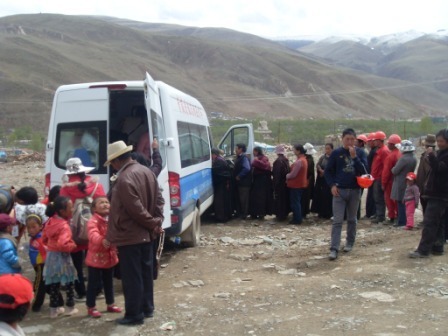 the referral and transportation of patients of difficult or severe cases to clinics in Yushu, or partner-hospitals in Xining (the capital of Qinghai) (eg. 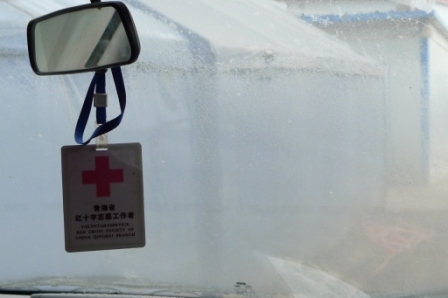 Red Cross Hospital); or even Beijing. partnership with Save the Children Foundation for cleft lip & palate cases, scoliosis, congenital heart disease screening. education of nomad’s on good medical and health practices/habits. This project is now complete to Adventure4Aid’s satisfaction. Although it has been a long process, I felt it extremely necessary and a privilege to see it through to its intended end. You have entrusted me with these funds and I am happy that it has indeed been put to its purpose. As some of you know, during this project, I have gone through two life-stage changes, and embarking on this second, new and exciting one next month! So, for the next little while, I will only be able to dream of the next cool adventure to raise funds for another worthwhile project. If you are interested to join with me in planning cool adventures or worthwhile projects, please write to me via the Contact tab at the top of this website. If you no longer wish to receive notifications of new posts, please also contact me using the Contact tab. With the refund money from the first Mobile Clinic (see previous post), a lot of research, test driving of different brands, and correspondence with me, LOVEQTRA has purchased a Maxus 15 seater van, a much better and hardier brand than the first Mobile Clinic. Maxus was originally a joint venture between LDV Group (a British van manufacturer) and General Motors. 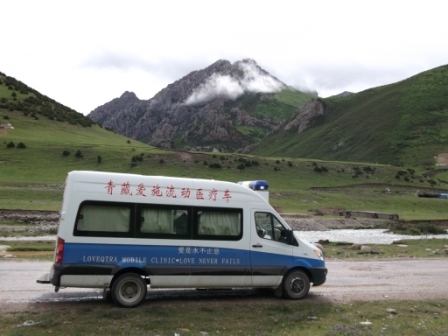 LOVEQTRA had purchased a Maxus with another donor’s funds and had driven it extensively to and around Golog Prefecture (altitude 4,200m), which is even higher than Yushu (3,800m), where our Mobile Clinic will be put to use. The engine is powerful and has performed well in high altitude areas. 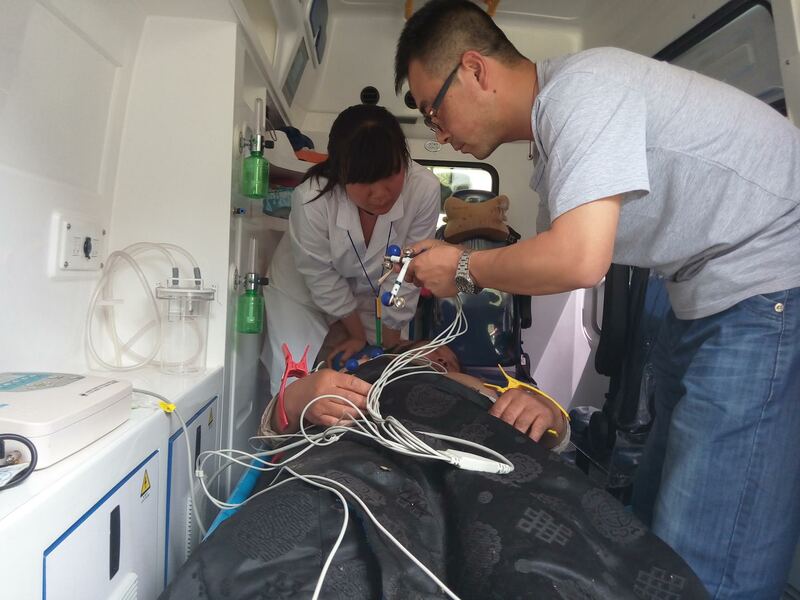 The purpose-built fitting out with medical equipment has been completed, and it is being driven from Ningbo Province back to Qinghai Province by two of their drivers. ETA is 11th July. 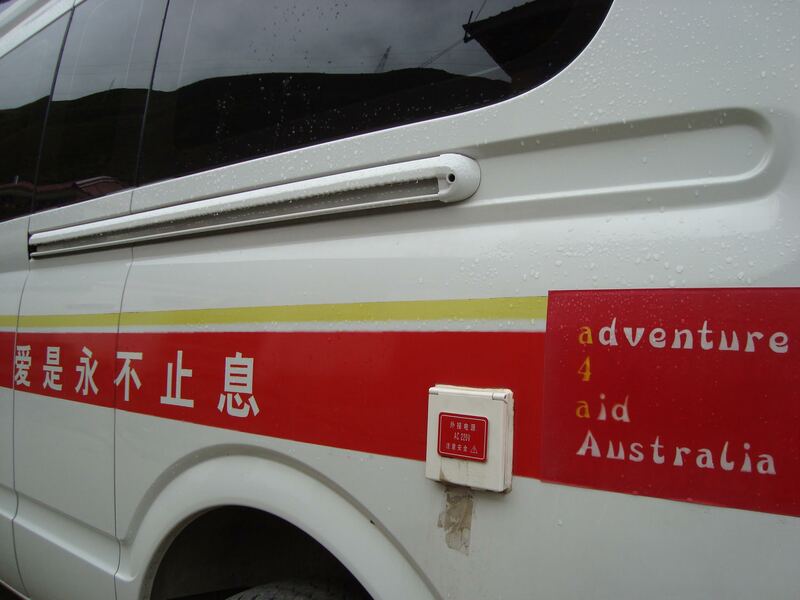 Once in Qinghai, the vehicle will be registered and all the logos and words put on (see the mock-up of the paint work in the photo above). 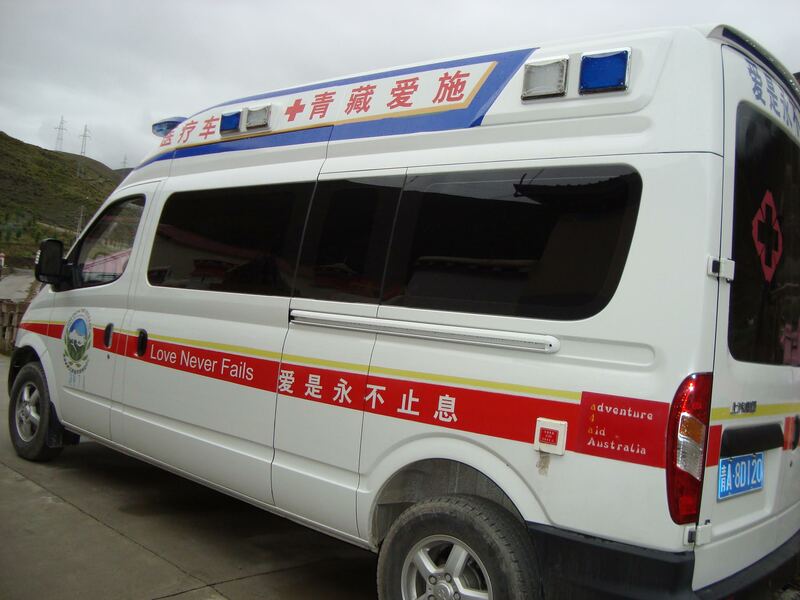 LOVEQTRA plans to drive the Mobile Clinic up to Yushu by 25 July, and it will carry their medical team to conduct a month-long medical service tour in hard-to-access villages and surrounding areas. 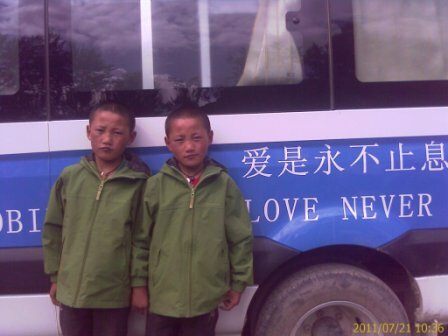 Meanwhile, LOVEQTRA has just sent me a report on their medical service, written by their medical team in Yushu. After having it translated, I will pour through that with a fine-toothed comb to see if we are able to put the balance of our funds to their medicinal needs. It has been a while since you last heard from me regarding the status of the vehicle. 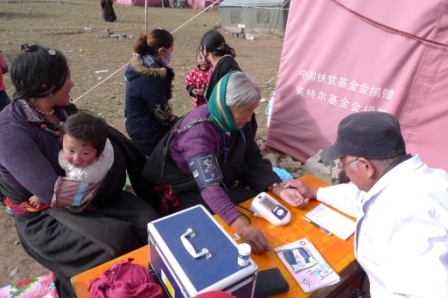 As in the previous update when I went to inspect the vehicle and medical work in situ– in Yushu, Qinghai- the site of the earthquake, despite not having a properly functioning mobile clinic, the medical work has never stopped. Currently, the work still continues in a city van, and is sufficient for county town to county town, where it is doing real good; but cannot reach the nomads higher in the grasslands, where they need it more. 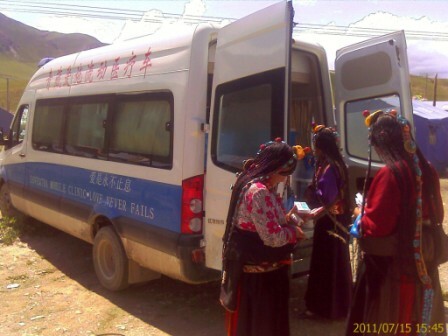 It is important for us to remember that this is Qinghai’s FIRST MOBILE CLINIC. This has not been done before, and therefore, this is the first time for ALL the people involved in this project. After repeated mechanical problems, which put staff and volunteers at risk on the high, snowy, mountainous terrain, LOVEQTRA demanded a full refund of our vehicle from JAC, the manufacturer. After many months of LENGTHY and delicate negotiations with this giant corporation, JAC (miraculously) finally admitted their error by taking their faulty vehicles back and gave LOVEQTRA a refund minus the cost on in-fitting. It took them another six months to send the refund. I say miraculously because no one would ever dream that a Chinese manufacturer or seller would take their product back. 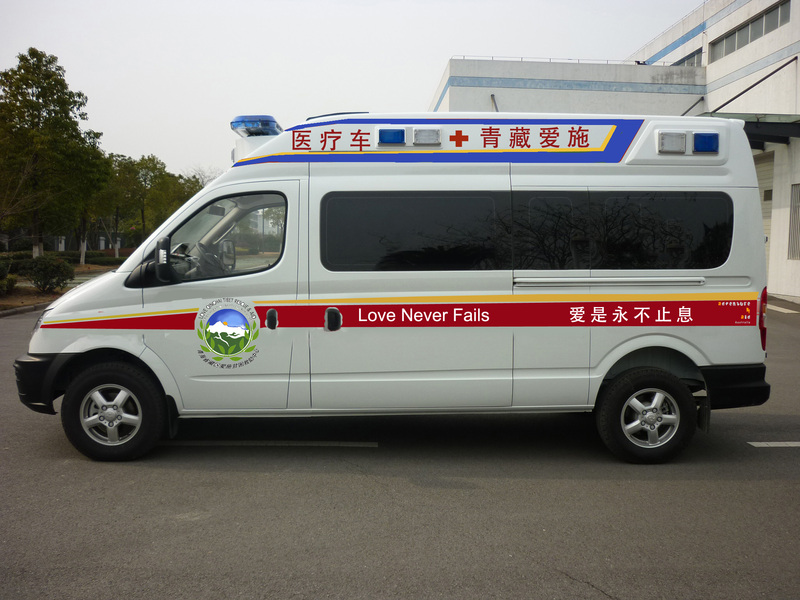 As we can imagine, LOVEQTRA are anxious to move forward, and has been researching a more reliable vehicle for our Mobile Clinic version 2. Because of LOVEQTRA’s bad experience the first time, they intend this time to buy international brands like Ford’s Transit, or Iveco, which is obviously more costly. Why didn’t LOVEQTRA buy an Iveco or Ford Transit in the first place? In the beginning, LOVEQTRA sought to buy an Iveco (European-made), but the entire Iveco team at that time had moved to JAC and were working on a similar heavy-duty vehicle to Iveco, with all of Iveco’s expertise, at an affordable price, so they purchased from JAC. Bad Experience = Blessing in Disguise- HOW? The LOVEQTRA team are now more experienced in what they need (and don’t need), and what to negotiate for. 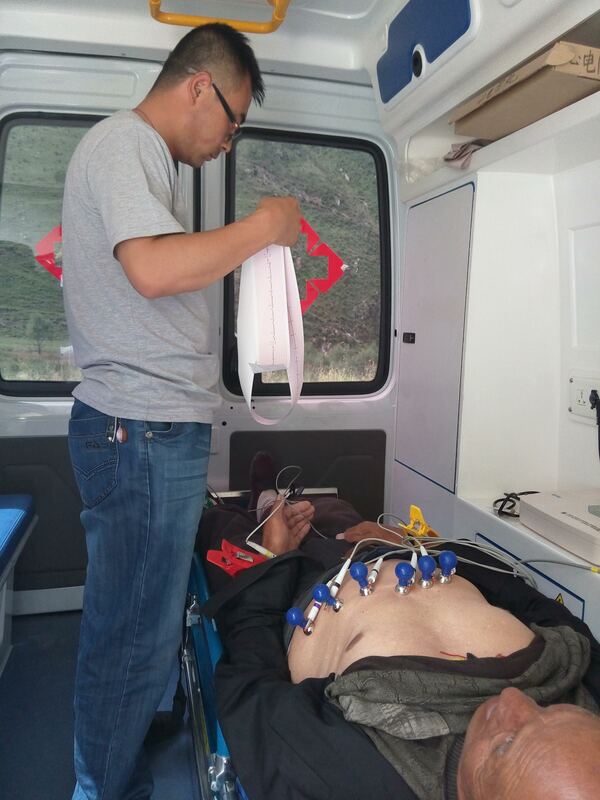 They are now more experienced with the fitting-out of the medical equipment in the vehicle. The first time round, doctors thought they needed more than they actually do to cope with the high altitude, rough terrain. This means potential cost savings here. I’ll keep you posted as I get updated from LOVEQTRA about their research for a new, more reliable vehicle. As I mentioned above, we have only been refunded the vehicle cost, less the in-fitting. The new vehicle will cost more, but we can save a bit from more streamlined equipment fitting. We will not have enough for 2 full vehicles of this more reliable brand vehicle. The options worth considering are to use the rest of the funds to pay for medicine for the clinic; or more funds could be raised to make it to 2 vehicles. I’ve been back for a couple of weeks now. Thanks to Frank for sending some updates when I could get them out to you. [To refresh your memories on the Mobile Clinic Project, don’t forget, you can go to “The Problem” & “A Solution” pages of this website, & of course, our previous blog entries & photos]. It was a tough trip, I honestly didn’t expect it to be. 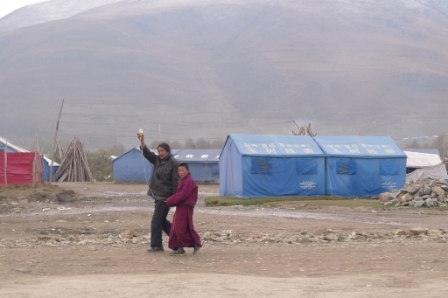 When I first started fundraising for this Project in January 2010, people hardly knew of Qinghai, the province in China, for which I was fundraising, let alone Yushu [Tibetan: Jyekundo], a predominantly Tibetan prefecture in Qinghai. 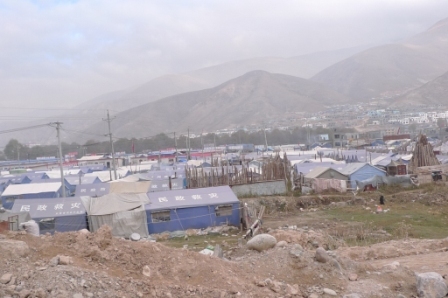 On the 14th of April 2010, Yushu suffered a magnitude 6.9 earthquake, which claimed over 2,600 lives and left over 12,000 injured. 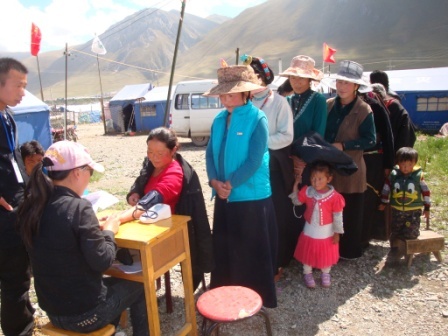 Suddenly, Yushu was the centre of world attention- everyone knew where I was fundraising for; and it made the Mobile Clinic even more urgent. I figured I would have no trouble with the altitude (up to 3900m), and the cold (it can’t be worse than the mountain we climbed last year! 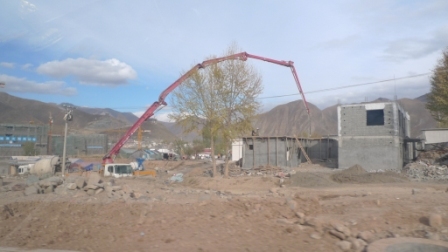 ), and these didn’t really affect me, but what I didn’t expect, was to be having trouble with the thick dust from the non-stop construction and rebuilding of the entire town. 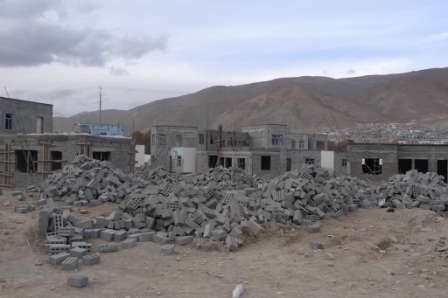 I also didn’t expect the rebuilding to be at such an early stage (my perspective only), but they had to wait an appropriate amount of time to allow for the many aftershocks, and construction can only be done 5 months a year because of the inclement weather and altitude. A lot of the workers come from other provinces in China and they can’t withstand the high altitude for more than a few months at a time. 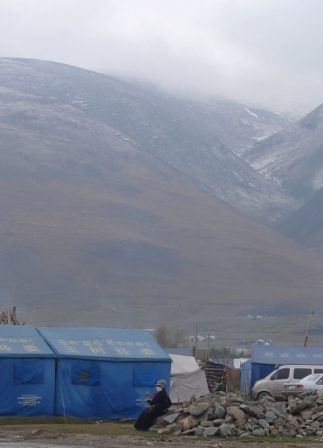 The snow season also started as we left Yushu. 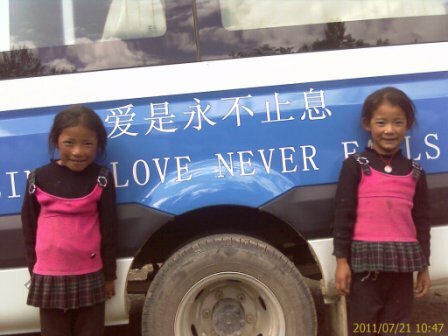 I stayed with my friend Maggie, (who travelled with me to Yushu), in an orphanage school, thanks to the help and good relations (guanxi) of some friends. 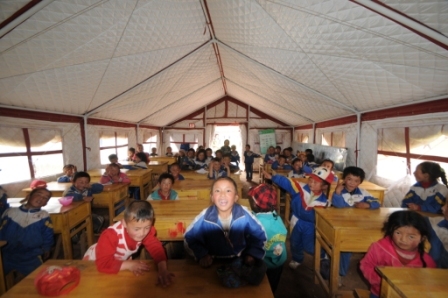 Before the earthquake, students numbered just over 200; after the earthquake, there were around 160 new orphans to the school. 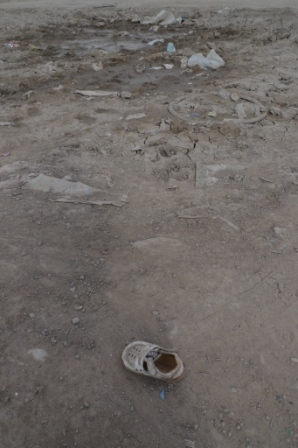 We were told schools and hospitals were the priority, so they have to be rebuilt first. This one was still in temporary buildings (like the demountables we sometimes see in Australian schools as add-on classrooms). One night, Maggie and I were suited up in our down jackets etc, walking to the toilet, about 20 metres from our room. When I put my head-lamp on, I thought it was snow falling into the shine of my torch, but soon realised it was raining dust! This quickly entered my lungs and caused inflammation from all the coughing….. and then the whole deal. I couldn’t escape it, even at night I slept with a mask on. At some points, I felt worse than I did on the mountain last year. (Frank is happy to stand corrected in his previous update on my behalf- there was by no means any air conditioning in our rooms!). I wore the mask day and night, so much so that people on the grasslands thought I was the doctor! 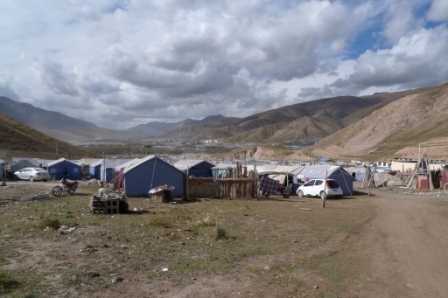 After a 10 minute motorbike ride to the nearest shower, I had to pluck poor Maggie away from it, as the principal of the school insisted we didn’t shower while in Yushu- if we caught a cold, “we wouldn’t recover (at this altitude)”. I was sure glad we heeded his advice when my cough wouldn’t subside! 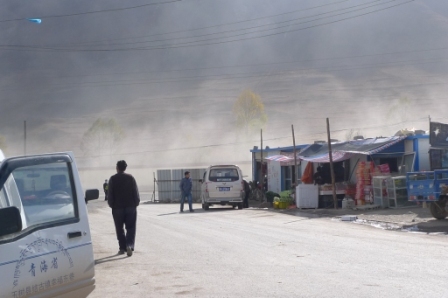 I’ll tell you a secret- the first time I lived in rural Qinghai, I didn’t shower for a month because it was so freezing cold and the only shower was so far into town. It’s a well-documented fact that Maggie struggled for 4 days! Well, there’s a mixed bag of news, but it’s positive news overall! 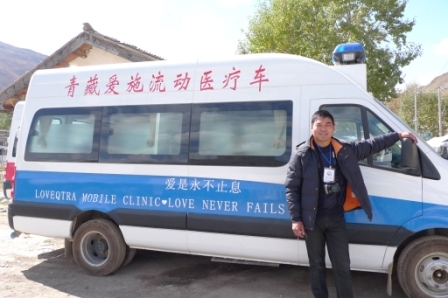 The Mobile Clinic donated by YOU has, via LOVEQTRA (Love Qinghai Tibet Rescue & Aid), enabled much-needed medical services to be available to impoverished and remote nomads in the harsh, inaccessible grasslands of Yushu Tibetan Autonomous Prefecture. Since registration in May, our Mobile Clinic has enabled a total of 5,500 people to be received and treated. 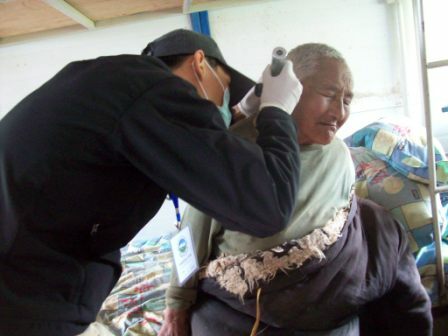 The Clinic circulated designated routes around the grasslands and pastoral areas, covering 3,500km in Yushu. This was the schedule on Mondays, Wednesdays, and Fridays. Tuesdays and Thursdays, teams of LOVEQTRA volunteers carried out family visits, bringing much-needed supplies- blankets, clothes etc. to those families in need or that couldn’t physically make the designated meeting points. 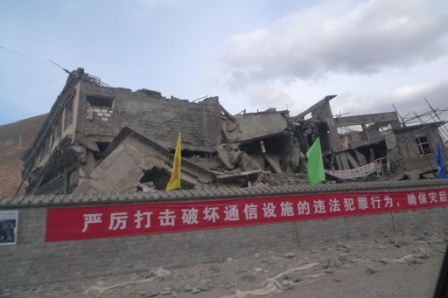 More than 3 months were devoted to Jiegu Township, the centre of the earthquake zone. LOVEQTRA received 11 voluntary short-term medical teams, with a total of 28 doctors and nurses from Malaysia, Australia, U.K., Taiwan, Hong Kong, and other provinces in China. These visits included the training and upskilling of local doctors and nurses in ultrasound and other techniques, dental clinics, Hepatitis B prevention, to name a few. 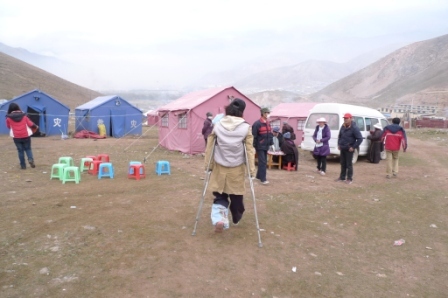 The Mobile Clinic Project employs 7 long-term staff (doctors, nurses and assisting staff). 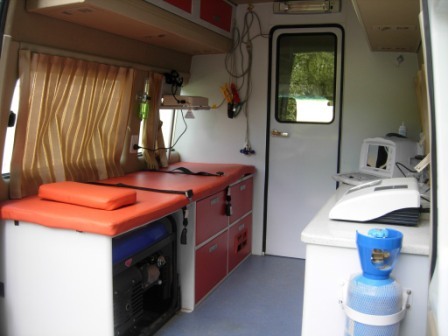 The beauty of the Mobile Clinic is that it not only allows LOVEQTRA to take doctors’ services, medicine and supplies to the inaccessible, it can generate electricity, enabling the use of medical machines in examinations. It also carries oxygen, for emergencies and during patient transport to the city hospitals in more serious cases (a 12 hour drive). 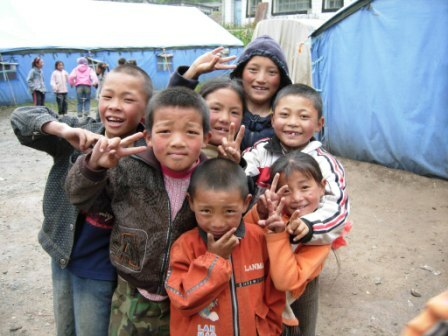 The report given to me by staff, informs us that LOVEQTRA assisted and continues to assist West China Children’s Rescue Foundation in checking, transferring and treating children with deformities. 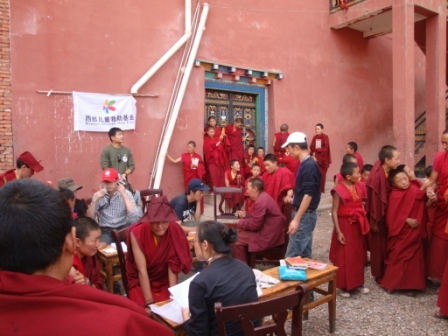 It has also cooperated with Qinghai University in checking and treating rheumatoid arthritis among ethnic minorities in Qinghai. What we saw in October……. 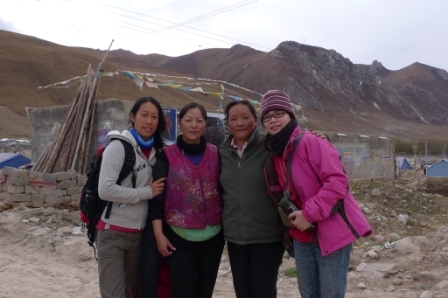 When we arrived in Yushu, I was happy to see a very cohesive bunch of volunteers from all around China. 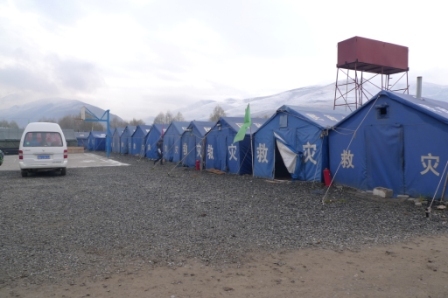 Their headquarters is the ‘LOVEQTRA Base Camp’, a cluster of tents and simple structures. They have organised themselves into teams and were rostered on for different tasks every day, as per the above schedule; a different team would be rostered on each day to cook for the entire group, and boy can they all cook! The not-so-good news is that the Mobile Clinic was experiencing mechanical problems. 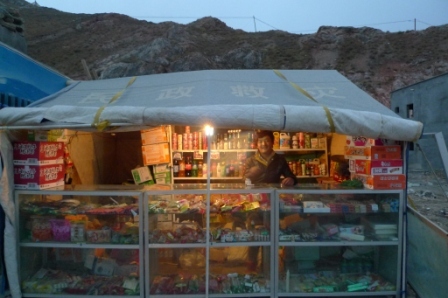 According to the Base Camp Manager, it was to do with the fuel and air mix, since the air is so thin at this altitude. The Mobile Clinic still runs, but because the harsh winter is upon them, they don’t want to push it, and have it totally break down. LOVEQTRA is in discussions and negotiations with the manufacturer. The company is in another province (of a much lower altitude); as Qinghai does not have the manufacturers capable of this sort of project. 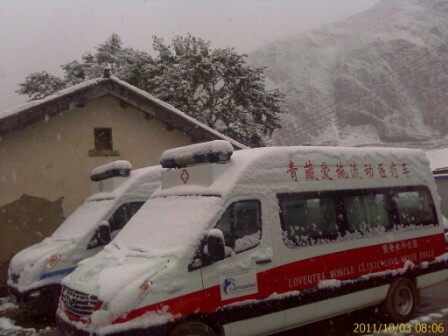 The consequence of that is that they are not experts in the mechanics at altitude, and this is a first for everybody concerned; as LOVEQTRA founder, Philip Poh, put it- this was the first fully equipped and staffed Mobile Clinic in Qinghai. I have yet to receive more information about the mechanical aspects of the problem. We followed different teams around for 3 days, and what we witnessed was something special- the bringing together of services and those who need it. Because the snow hasn’t set in yet, we were able to go in normal vans, but obviously not with all the medical equipment. We stopped at designated routes on the grasslands, where nomads would come, having heard through word of mouth about the Mobile Clinic and the location of the stops. Of course, this has been happening since the earthquake, so people know about it and its faithful timetable. As mentioned above, the Mobile Clinic Project employs 7 long-term staff (doctors, nurses and assisting staff). Our funds raised also goes towards this for the first year. After that, LOVEQTRA, through their ongoing fundraising efforts, will ensure the longevity of the Project. The aim is to grow it to a fleet of ambulances. There was already a second donated Clinic (the red one beside ours in the photos). LOVEQTRA and I continue to appeal for volunteer doctors (GPs or specialists), nurses, and medical assistants willing to volunteer for 1 week or more, to give the current doctors a break. One of the doctors came out of retirement to serve here full-time, despite his own health problems. Another young doctor gave up a promising, well-paid career to give his fellow compatriots the precious gift of health. It’s enough to make you cry. Regarding our second batch of funds, I am monitoring closely the effectiveness of the first Mobile Clinic before releasing the money to purchase the second. I was very pleased with the services around the Mobile Clinic, and that they continued, despite the Vehicle being parked at Base Camp. I would hope for one or more professional opinion/s regarding the mechanical problem and how it can be rectified. As always, I will keep you posted! ** This blog entry wouldn’t be complete if I didn’t express my respect and gratitude to the staff and volunteers whom we met and took us on their rounds with them, which was a privilege. They even came to the orphanage school and treated my cough, which got worse during the 4 days. I was quite embarrassed and they even refused to take my money for medicine, saying that it’s nothing compared the gift of a Mobile Clinic! I was very moved. ** I want to thank our three friends (angels really), who didn’t have to, but arranged transport, accommodation and everything else in between so that Maggie and I could have a smooth trip. 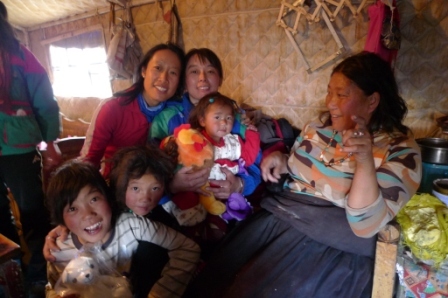 ** The principal of the orphanage school let us stay there and put us up for another night when our flight was snowed in. I should also thank Maggie for traveling with me, suffering the effects of altitude, and sharing this experience with me. ** I also owe heaps to my Mom– who helped me translate the LOVEQTRA reports into English, so I could get this info out to you, the Donors. Thanks Ma! ** Of course I want to thanks you guys, who donated the Mobile Clinic. A feel-good moment indeed! Earthquake Memorial- this building will stay. What a guy! Basecamp manager, Brother H.
I’m Frank – I was part of Jiji’s team last year and this year – I’m going to try to relay sms text messages from where she is and experiencing. Hopefully my translation of the sms messages will make sense. 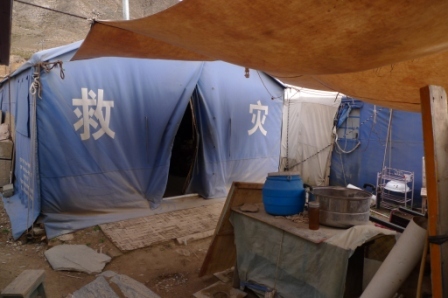 Her last entry indicated she was off to Qinghai, and there she would teach English in a local school and then she would be going to checkout the first of the mobile clinics with a friend, Maggie. 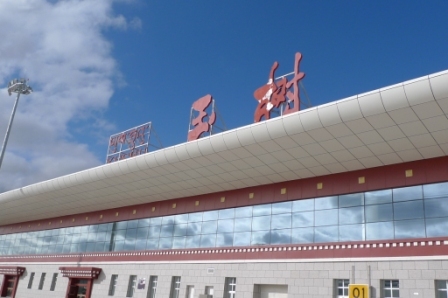 Arrived at Yushu in the afternoon with my friend Maggie. We have have finished spending 2 weeks at a disabled Orphanage and teaching English in a Nomad School. Really looking forward to getting some much needed sleep as we are quite tired. There is a lot of dust from the continual rebuilding as a result of the earthquake last year, which happened on the 14th April 2010. Construction is literally everywhere as they rebuild the whole town. Unfortunately, for us the side effect is we are developing a bad cough from the continual rain of dust. We cannot escape from its reach, even when we try to sleep in an air-conditioned room it still feels thick with dust in the air. 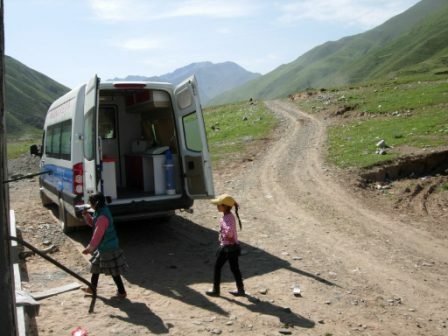 We hope we will fair better tomorrow, we go to the grasslands with Doctors who usually work on the clinic. I’m heading to Qinghai in a day’s time with a great and motivated team, to spend some time with kids in the 1st and largest orphanage in Qinghai, and teach English in a local school. The kids at the school are all children of nomad families, in similar circumstances to the ones whom would be helped by our Mobile Clinic. This is the same volunteer work Frank (from the climbing team) and I were doing last year before the big climb. After this, I’ll be going to check out the Mobile Clinic that all of you helped to raise funds for (with another team member Maggie). I want to see the success and administration of the first one first, before I do anything about a second Clinic. The balance of the funds are in the Rotary Trust account. Be assured, I will be keeping in contact about how your hard-earned money is being spent. 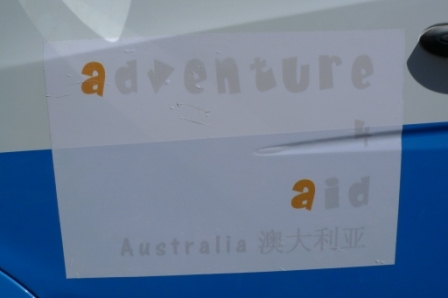 Thankyou for supporting Adventure4Aid to be able to raise enough funds for TWO Mobile Clinics, when the target was just one. The first one is planned to be up and running by as early as April! 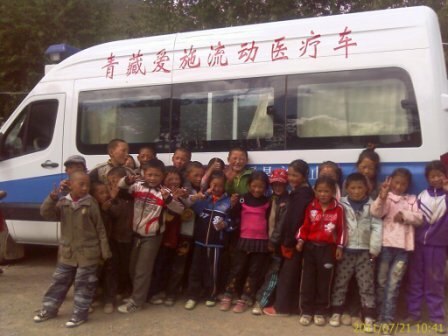 I will be going to Qinghai to see the Mobile Clinic in action for myself in (likely to be mid) October this year, and invite any of our supporters, sponsors, their family and friends to join our trip (up to 2 weeks). We already have a family interested in coming. 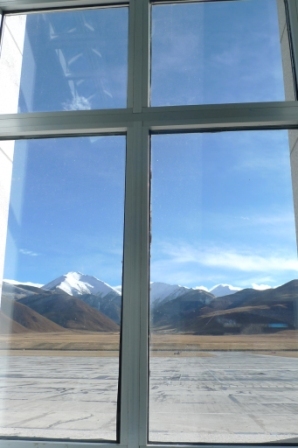 To get an idea of what environment you’ll be visiting, please browse the photos on this website (various pages & the actual Climb blogposts), or Google Qinghai. 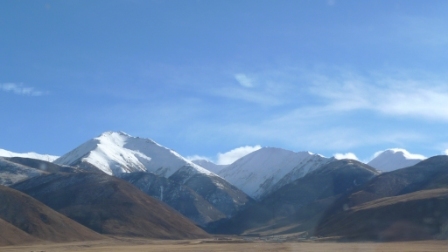 The landscape on the Tibetan Plateau is amazing! 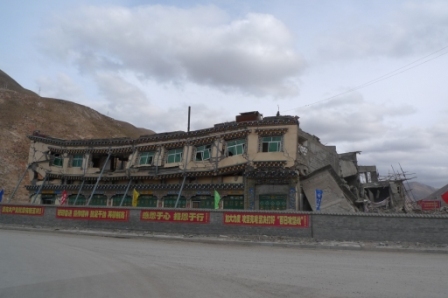 We’ll be staying in Xining (capital), and towns on the way to Yushu Prefecture, the site of last year’s earthquake. 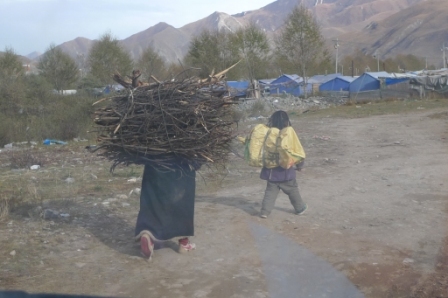 You’ll come away from the trip more aware of the needs and poverty of nomads and farmers in Qinghai. You’ll be immersed in Tibetan culture and way of life, but your eyes will also be opened to the many other cultures that exist in Qinghai. October will be autumn and could be anywhere from T-shirt to down-jacket weather. We might be lucky and get snow! We’ll be staying at altitudes of 2,200-4,000m, so the first week you will be acclimatising and enjoying the sites in and around Xining (2,200m). For those who might be interested, or just have questions, please shoot me an email (info@adventure4aid.com) as soon as you can, so that I can start planning as well. When I have a better idea on price, I’ll write again.